A documentary that looks at the fight to contain giant, invasive rat-like creatures in coastal Louisiana includes a savoury option: put them on the menu. 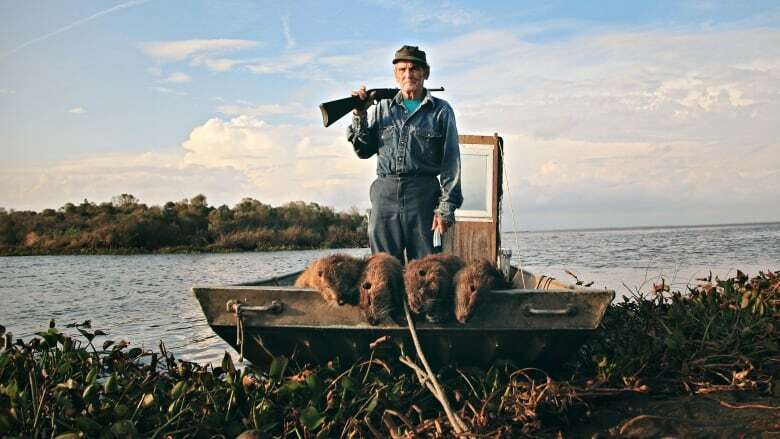 Filmmaker Chris Metzler tells The Homestretch what he learned about the hunters of nutria while making Rodents of Unusual Size, opening at the Calgary Underground Film Festival Thursday night. Q: How did you first hear about these rodents of unusual size down in Louisiana? A: Well, like a lot of good documentaries, a little beer and late-night conversation factored into things. I was on a road trip around Louisiana about a decade ago and was screening another documentary, and one of the programmers at the festival said "Well, you like weird, offbeat environmental stories, wait till you hear what we have here in Louisiana." And then he went on to spin this tale of this giant, 20-pound, invasive species called nutria that were eating at the coastline and destroying all these communities, and the state was coming up with all kinds of weird ways to combat these giant rats, including eating them. And it just stuck in my mind. And then, many years later, myself and two friends decided to dig in and make a documentary. Q: Can you describe these creatures for us? A: Like a New York City sewer rat on steroids. They have these really big front orange teeth and these giant rat-like hands in the front with a really long rat tail. They're about 20, 25 pounds. One thing that makes them a little bit weird is they're semi-aquatic, so their back legs are kind of like ducks'. They are like a hybrid between a big rat and a beaver. They look a little bit more atrocious than the real threat, because they're vegetarian. They just love to eat the roots of the swamp and the wetlands and that's the thing that causes the problem. A: They were brought from Argentina. Nutria are native to South America, particularly Argentina. Back in the 1930s and during the Great Depression, a few entrepreneurial businessmen decided the thing that would change things around economically, would be to import these giant rats from Argentina and raise them for fur. At the time, fur was a big industry in Louisiana, particularly with hunting and trapping muskrats. But muskrat are four or five pounds. Nutria are 20 or 30 pounds. So you can kind of supersize them and get a lot more bang for your buck. Unfortunately, the scheme didn't work out well, and after a hurricane or two, some nutria escaped. Some people probably let them out into the wild, and they breed like rabbits and they soon took over. Q: The stars of your film are the hunters, not the animals. Tell us about Thomas Gonzalez. A: When we went to make this film, we didn't want to make it just about the rats. They are their own kind of hook in some way. But really it's about the people that are being threatened with this devastation. One of them is 80-year-old Thomas Gonzalez. He's kind of this old Cajun guy that crabs and fishes for a living. He's going to come up with some inventive ways to hunt and trap and try to get rid of all the nutria from Delacroix Island. He just has such a wonderful outlook on things and a poetic way of talking that we couldn't have found a better character along with him and his family, some of the few people left on the island. We really wanted to show what was at stake in regards to culture, that it's not just the place or the land that's being lost. It's also about the culture that's threatened when these places disappear and we tried to show it through his eyes, to show why he's in love with the place and maybe why it's important and worth saving. Q: How many of these animals are there in coastal Louisiana? A: About 20 years ago, there were 25 million nutria, and then the state started coming up with lots of ways to combat them: getting celebrity chefs to try to encourage people to eat nutria, they tried to rejuvenate the fur fashion industry and then they also started a bounty program where they would give you $5 for every nutria killed. The way you prove it is by cutting off the tail and bringing it in. These efforts have been pretty successful. Now they estimate there's maybe six or seven million nutria in southern Louisiana, but it's probably not ever going to get much less than that because the nutria reproduce so rapidly. Q: What kind of effect have they had on the environment? A: Many acres of wetlands are lost each year in Louisiana, and it's kind of a triple threat of the oil and gas industry and development combined with the nutria. It has really laid waste to southern Louisiana. When these plants are eaten, the sand and the soil that was there washes away and they lose the land. If you remove the nutria from the area, then it stops the kind of coastal erosion and the land from being lost. Gonzalez's island was at one point half a mile or a mile wide. Now it's maybe 300 feet wide. It's lost a lot of land over the years and so really it's about maintaining the status quo at the moment. And if they can remove the nutria from the area, then that stops the erosion. But people often wonder, "Why should I care about this place?" It might be beautiful and we might care about these people, but these coastal wetlands are what protect Louisiana and much of the Gulf Coast from tropical storms and hurricanes. And so when you don't have it, you have really severe effects similar to what you saw with Hurricane Katrina. As you lose these lands, the impact the hurricanes and climate change have on these areas becomes more severe. The nutria have to have some place to go, and so now they're showing up in the canals of New Orleans. Q: What kind of response are you receiving to your documentary? A: It's been kind of heartwarming to get out and travel around with the film because we like to do Q&As afterwards. What we found is that the film plays really well in big cities and small towns and even in rural areas. We thought people might be a little queasy from seeing these animals killed but also eaten. But people quickly fall in love with the people and just think it's such a weird situation that it's an entertaining and kind of darkly comic sort of story, and so we feel like we've succeeded with that. People have come up to us afterwards and said, "it seems so strange I had to check it out and I'm glad that I did." There are a couple of cringing moments but like any sort of environmental horror film, you have to have a couple of those to kind of recognize what's at stake.